Sunday Deals: A Rundown Of Promo Codes, Free Ships, Etc. Retailmenot. For additional promo and freeshipping codes. Bradsdeals. Individual contributors share bargains along , plus promo codes, etc., plus Brad often gets additional deals with retailers on price and shipping. Great site for piggybacking promos. Freeshipping.org. One of the older sites on the web, originally offered freeshipping codes, but has expanded to listing promo codes and sales. ***Coming soon to Markdown Mom’s Facebook Rapid Deals and more! Watch for it!!! Hot Smashbox On The Rocks Photo Op Eye Shadow Luxe Palette Over 30% Off! Get a Super Sunday Stocking Stuffer Deal at Ulta® with Smashbox On The Rocks Photo Op Eye Shadow Luxe Palette, reg. $42, now $29.00. This doesn’t qualify for extra coupon reduction, but on other items, take an extra 20% off entire purchase. 20% off online with promo: 200493 or instore coupon. Free Shipping when you spend $50. This palette has a 4.6 star rating out of 5. Includes 28 party colors and nudes. A $250 value. Plus earn extra points for future purchases on your Ulta Rewards Card! MarkdownMom Says Give One and Buy One For Yourself! Plus Real Women Dollars Begins today through 8/11/2014. Get $25 for every $50 spent in store or online. Ship to local Lane Bryant store & get Free Shipping! Designer Sale Does It In Spades~Kate Spade! More and more high-end designers are adding a “sale“ category to their online sites. Kate Spade of New York is having a sale on purses, jewelry, shoes, and apparel. Now items are limited and even 50% off can still be pricey, but if you want the designer look at a savings, now is the time to act! MarkdownMom found a pair of Park Guell earrings in one of season’s hottest colors for only $34, reg.$78. Plus you get free shipping, no minimum–sales tax will be applied. 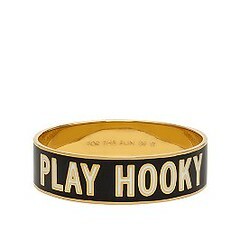 Pictured is this novel idiom bangle reg.$88, sale priced at $39–55%off! MarkdownMom just received a phone call from Lands End about a special private sale. If you are looking for a deal this weekend on classic fashion including great prices on cashmere, fine gauge cottons, and interlocks, then run to this sale! Get 30% off a single order of $50 or more plus Free Shipping. 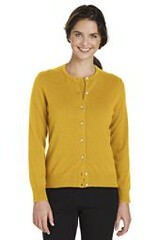 This means you can get the classic and timeless look of luxury, a cashmere sweater at under $60 at Lands End Overstocks! 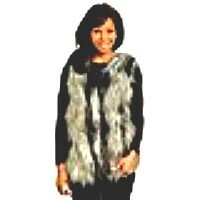 Save on fashion for the entire family including pets! Use promo code: JAN24 Pin #5381. Good only through January 24, 2011. For additional or purchases under $50, use Promo Code: WOW30, Pin#4518! Online only, some exceptions apply. Once a year Target Super Centers offers freshwater frozen lobster tails. For $6.99 a piece, this is a super deal if you have checked what having a lobster in a restaurant costs. 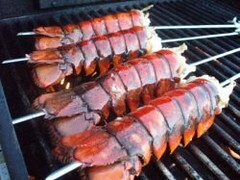 You can steam these, put them with other seafood, or better yet, they are perfect for the grill. Here’s your chance to feast like a king, but hurry as this comes once a year, and in Minneapolis, MN and probably others it’s here for Valentine’s Day! While you’re at it, keep up on Target’s Daily Deals. Deal: BOGO-Buy One Get One Free and variations-is showing up more frequently. JCPenney® instore has a buy 1 get 1 for $1.00 on its’ entire stock of bed pillows this week including posturepedic and egyptian pillows. Deal: Target® is holding Dollar Week. Now is the time to stock necessary sundries like detergent, TP, storage totes for college bound students, and the popular Magic Bullet® 17 pcs. set for $45. Deal: Sony Cyber Shot DSCS 730 7.2 MP digital camera. Best price: instore at Shopko® $119.99 with card. Price good through Thursday, July 17, 2008.